Have two 3 1/2 year old Giant Dy Geckos. Over last 2 weeks the one has developed major issues prior to shed. It started with some missing patches of skin that would heal and return after a couple of weeks. But this is bad and open sores have developed. Anybody have any thoughts? Need to try and heal this and prevent from happening again. Last edited by ewa2457; 10-21-2018 at 09:59 PM. Just uploaded photos. Do not believe this to be lighting as they have been in the same enclosure and system for last 3 years. Try to maintain a decent humidity level and temps in day of mid 80's and night mid 70's. Sorry I can't be of more assistance. It may be time for a reptile vet visit (though I can imagine that getting them there isn't going to be fun). Are they housed together? If so, is there any chance that one is biting the other? If they're housed together I imagine they've been together for years, but I've had geckos that got along fine for years change their minds and need to be separated. They have established their territories and "talk" alot to each other. But have witnessed very limited aggressive behavior. Trying to find a local vet for a house call. Just hoping someone may have seen something similar to offer quick advice. Neosporin or bacetracin ointment? It looks like this gecko was attacked by the other one. Do you know their sexes? Even 2 females can suddenly have bad days and get into serious fights. 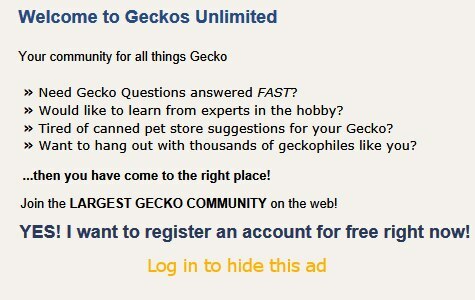 Separate these geckos right away. Use a paper towel substrate until the injury heals. Keep up misting and UVB lighting. Some vets use silver sulfadiazine cream (silvadene cream) in place of any ointment. "Herd" the injured gecko into a tall ventilated deli cup or a large ventilated tupperware/Gladware container for a vet trip. You might find some vet who could offer assistance based upon your photo. Please keep this thread updated. Last edited by Elizabeth Freer; 10-23-2018 at 05:14 AM. Youch...I would agree - separate immediately. I hope this one heals up well. Upon increasing the misting and using a "shed aid" spray, the injuries healed. Unfortunately, they continue to develop skin issues at their sides. Have cleared some plants from the terrarium in fear that they are getting caught on them. At a loss for these issues that are only months old after years of perfect health and skin. created a new terrarium to separate them. Believe they are both males. Males can fight to death! You're lucky this one is healing. I'm glad you've separated them. Males should be separated as soon as you can tell, because they know sooner than we do that they're boys. Part of the recurrent problem could be dietary. What are you feeding them? What type lighting do they have? Perhaps a vet could prescribe a topical cream that would speed up healing. Silver sulfadiazine cream is excellent.